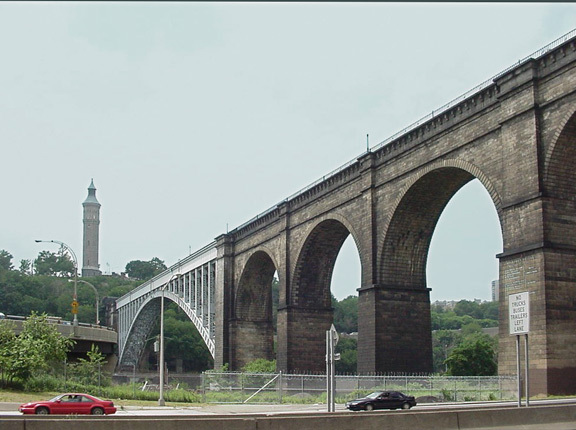 High Bridge Aqueduct is part of the Croton Aqueduct system. It crosses the Harlem River, bringing water into New York City from the Croton Reservoir, 40 miles to the north. The bridge was in service from 1848 until 1917, though it remained open as a pedestrian bridge until 1960. The center spans were replaced by the steel girder arch in 1927. It was designated a landmark in 1970. The tower on the hill to the west of the bridge is the High Bridge Watchtower, used to equalize the water pressure. In the 1995 murder mystery The Alienist by Caleb Carr, the tower was the scene of a climactic confrontation. Photos are by Jim K. Georges, and were taken from the Major Deegan Expressway (I-87). For an excellent history of the bridge, see this link: High Bridge.